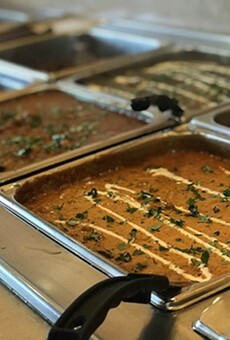 The food at Gandhi's is so good, we wouldn't be surprised if customers suddenly burst into song, as characters are so wont to do in Bollywood musicals. The cozy dining room, however, precludes any large-scale dance production numbers. There are no bad guys here, either, with an extensive menu that highlights Northern Indian Moghal recipes such as rogan josh, tandoori chicken and a variety of rice pilaf biryanis. There are also plenty of options for serious vegetarians working on their karma. Naan, Indian flat bread, plain or with a choice of toppings, complements the main dishes, served on platters with a bit of dal, raita and fruit. Try the yogurt-based mango lassi for a deliciously different beverage. The lunch buffet offers a quick way to learn about one of the oldest and most flavorful cuisines in the world. Break out into song if you want--just don't start dancing.